This is how Janáček described his confessional second string quartet of 1927, 'Intimate Letters', to Kamila Stösslová, the woman thirty-five years his junior who he was deeply in love with for the last ten years of his life. The unrequited affair was remarkably productive for the composer, inspiring – amongst other things – the blissful contentedness of the love music in Kát'a Kabanová. It appears that, apart from one solitary kiss a few months before his death in 1928, they were never physically intimate. The quartet is instead based around a fantasy relationship that Janáček constructed following her agreement to at least acknowledge his love for her. The earlier quartet, 'Kreuzer Sonata' of 1923, also fits into the story. It is based on an earlier piano trio of the same name, written in 1908 before he met Kamila. But, the Tolstoy novella openly advocates extra-marital liasons, and in reworking the piece he was able to write many 'intimate letters' to Kamila on the subject. So the quartet might be seen as a prop in the elaborate mind games the composer was playing with the young married woman. I mention the not-so-salacious details of Janáček's personal life because they provide a helpful way into these quartets, which may be a little difficult for the first-time listener. These are not, however, like Berlioz or Strauss's programmatic works which benefit from a detailed knowledge of the narrative structure. It is only really after repeated listening, when the biographical details have faded into the background, that their true power and depth becomes apparent. 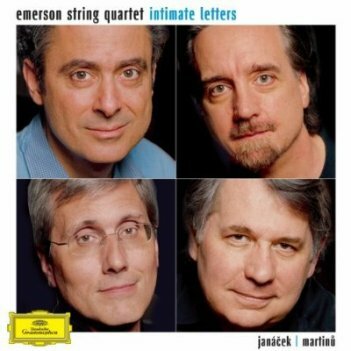 It is a thorough understanding of these musical intricacies, aided by their justly famed technical virtuosity and impeccable ensemble playing, that makes the recording by the Emerson Quartet a cut above its contenders. Janáček's late style is defined by its concision, economy and refinement. All of the movements in both quartets are around five minutes in length and are constructed using what has been called a 'mosaic' or 'tapestry' technique. Sections of widely differing character are juxtaposed to create a disturbing, disorienting effect. But within such a concentrated, claustrophobic procedure, the Emersons are able to conjure the illusion of infinite space and time. Perhaps partly due to his anti-German nationalism, Janáček rejected the typically German methods of intensification. The forward drive in his music is not produced harmonically, nor through the progressive dissolution of motivic material, but through repetitive ostinati and nuanced variation in rhythm and instrumentation. I wouldn't go as far as Charles Mackerras – an early champion of the composer – in calling him 'the first minimalist' because the effect is one of cumulative tension, rather than hypnosis. The Emersons allow this tension to build up gradually, rather than actively pushing the music forward as is standard in the German repertory. Whereas composers ten or so years younger than Janáček, like Strauss or Mahler, are generally considered to be late romantics, the music of this period of Janáček's life is grouped with the modernists of the next generation, Schoenberg, Berg and so on. This is slightly misleading since one way of explaining his unique style is to think of his movements as basically traditional nineteenth-century forms into which 'intruder objects' – to borrow a phrase from avant-garde art criticism – have been placed. His genius is then in the way he alters the traditional material so that it accommodates these sonically alien intrusions. The Emersons go all out to make the contrast between alien and traditional material as great as possible, but still manage to stitch the two together into an integral whole. Perhaps the best example of this is the opening of the slow (third) movement of the 'Kreuzer Sonata'. It opens with a short two-part canon on a theme taken from the first movement of Beethoven's Kreuzer Sonata and is then interrupted by rapid fortissimo sul ponticello demisemiquavers. The theme is played as lightly and beautifully as possible, and then the fluttering figuration is played so close to the bridge that the notes whistle with fluctuating overtones. It sounds – as it should – like it comes from another world. This passage may represent the two protagonists of Tolstoy's novella falling in love as they practise Beethoven together but, as with all such moments in these quartets, the music is so sublime that it doesn't really matter. To sum up, then. The Emersons' elegant, nuanced playing lets Janáček's music speak for itself. On the other hand, it is never perfunctory. Unlike so many recordings, and even live performances, one feels that the players are always present, inhabiting the music. The result is a truly exceptional recording of these irresistible gems of the quartet repertory.